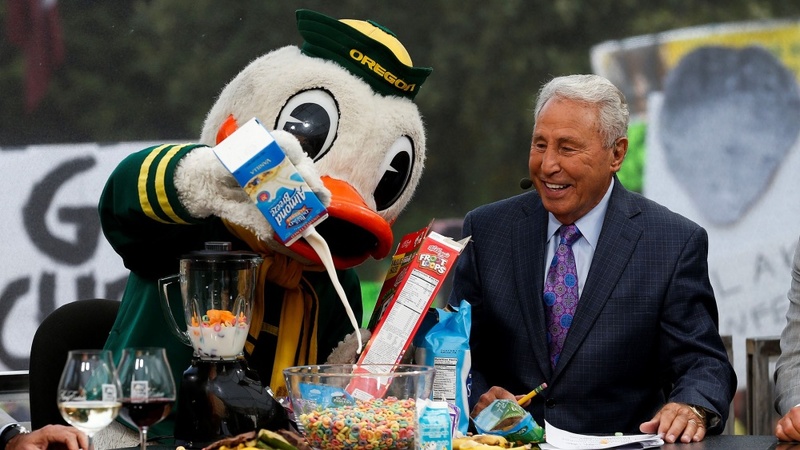 OK, Duck fans: Get out your flags and poster boards, because ESPN College GameDay is coming back to Eugene. The sports broadcasting giant's popular college football preview show returns to the University of Oregon this weekend for the first time since 2014. The draw for ESPN is Oregon's game Saturday at 5 p.m. with visiting Pac-12 North Division nemesis Stanford. It’s the first conference division game for both teams, and both are ranked: Stanford at No. 7 in the Associated Press poll and Oregon at No. 20. Both teams have Heisman Trophy hopefuls: senior running back Bryce Love for the Cardinal, who finished second in last year’s Heisman voting, and junior quarterback Justin Herbert for the Ducks. Both programs are 3-0 in 2018. Tickets have been going fast, and a sellout is possible. The Memorial Quad, with the Lillis Complex as a striking backdrop, will again host the stage and crowd for the show that comes on at a bleary-eyed 6 a.m. Saturday on the West Coast. Equipment trucks roll in Wednesday, and will set up in the closed-off northbound lanes of Kincaid Street between 15th and 13th avenues. The former staging site in Johnson Hall's old parking lot is now the Tykeson Hall construction site. For those braving the early morning chill, the Starbucks shop in the Erb Memorial Union will open at 5 a.m., and the show will be on the big screen TV in the EMU's O Lounge starting at 6 a.m. for those who would rather watch indoors. Oregon staff and TV crews will start work even earlier to get the site prepared and the show underway. This marks GameDay’s 10th visit to Eugene since 2000, tying the UO with USC for most in the Pac-12. The show’s presence has traditionally meant good things for Oregon. The Ducks are 7-2 in games at Autzen Stadium following the show, the last a dramatic 46-27 win for then-third-ranked Oregon over No. 7 Michigan State on Sept. 6, 2014, near the start of Marcus Mariota’s Heisman-winning final season at Oregon, when the Ducks advanced to the championship game of the College Football Playoff. Stanford has been Oregon’s opponent at two previous GameDay appearances in Eugene, a 52-31 Ducks win in 2010, and a 17-14 overtime loss to the Cardinal in 2012. Oregon is 14-8 overall in games linked to GameDay, giving them a 7-6 record on the road. GameDay is hosted by Rece Davis with analysts Kirk Herbstreit, Desmond Howard and Lee Corso. A show highlight is Corso finishing his predictions for that week’s marquee games by donning the head of one of the mascots in the host university’s game. No vulgar or inappropriate language. No bags, backpacks or purses. No markers, pens, pencils or dry-erase boards. As a scheduled user of that campus space, ESPN can set rules for attendance and being in the areas that will appear on camera, and can have uncooperative crowd members removed.